In 2007, the song of the year was no doubt Sean Kingston’s “Beautiful Girls”. The song was Kingston’s debut single and it reached number 1 on the Billboard Hot 100. Released in May of that year, it was unavoidable that summer, and because of that, it’s ingrained in the memories of a whole generation. The music video that accompanied it is also unforgettable, as it was one of the last few major hits on MTV, back when MTV still played music. A boy in the past wearing black chucks. The lyrics of the song are about a young man who is suicidal after his relationship with a beautiful girl fails miserably. In many of the “clean” versions, the words “suicidal” with “in denial”. However, as controversial as the lyric may be, it really does convey the message of the song: that heartbreak can really drive a person to dark places. The song features a sample from the classic Ben E. King song “Stand by Me”. Kingston’s voice is pitched digitally which give it the right tone to croon with the King sample. It all meshes supremely well, and it’s the sound these two elements create together that has made this song such a classic. A break dancer wearing yellow chucks. For a song with such a dark premise, the music video is very upbeat and bright. Directed by famed music video director Marcus Raboy, the video features Kingston interacting with a beautiful girl. 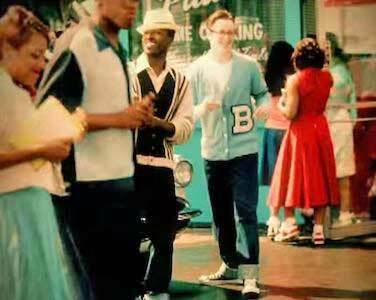 The video shifts back and forth between the time periods of the 1950’s and the early 2000’s (what was then the present). It really represents the blended styles of the song very well. The switch back and forth represents the blend of the doo wop era sample with Kingston’s more modern day hip-hop flare. We see people in both eras wearing chucks, which just goes to show how timeless the shoes really are. It’s a very fun video, and very memorable seeing as it was in constant rotation. These timeless chucks are still a stylish item today.